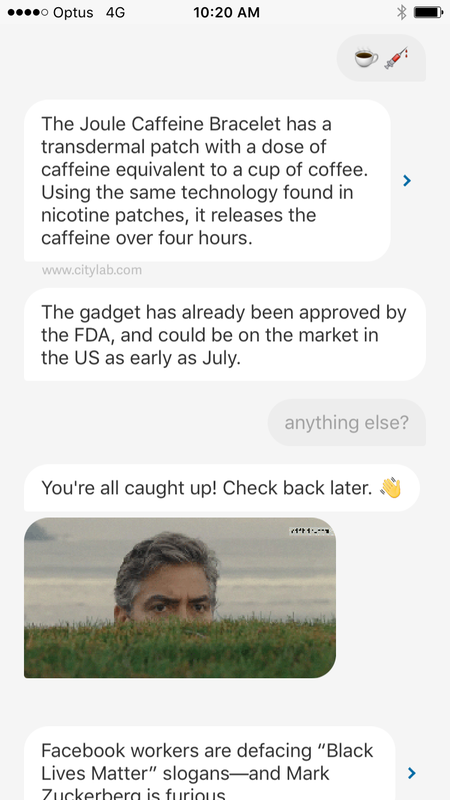 QZ have recently released a news reader app which uses a conversational style UI – mimicking the interactions that more normally take place in a person-to-person text or chat. Thanks to Rainer Wessler for pointing it out to me. I’ve been fascinated by this sort of interface for a while – wondering which scenarios it would work best in – so it’s great to see QZ having fun with this. 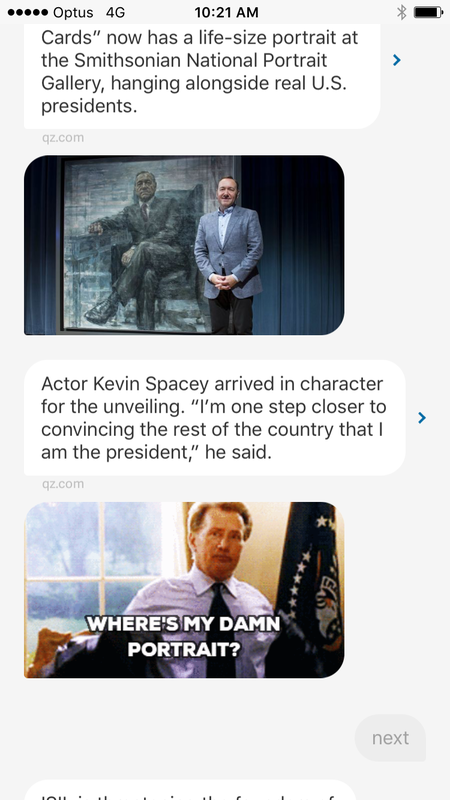 The app delivers news stories in text and image fragments with links through to QZ web articles, with cute prompts in between to keep you engaged and reading. Great fun to use and a really different approach to news delivery. This amazing, thesis-worthy work to scan old-master paintings for preservation purposes, has become the feed into a demonstration of the level of detail that a 3D printer can now create. Using a built-for-purpose 3D scanning rig, which employs regular DSLR’s and a projector, paintings have been captured down to the micro-metre level to capture the actual formation of the paint using brush strokes and finger daubing. I recommend watching all of the videos to get the full impression. As I proposed in an earlier post (where I failed to imagine this level of detail) the possibility of replication becoming widely available will create a whole set of new issues relating to protecting the ownership and Intellectual Property of existing works and force a rethink of copyright laws. It’s even conceivable that we could soon see legislation to limit what a 3D printer is capable of. Since Nokia were bought/sold themselves to Microsoft this week, there has been a flurry of articles around the theme of “Where they went wrong”, none of which lined up with my own memory of one of the significant turning points in the development of smartphones. In 2007 to 2009 I headed up the Devices teams at 3 Mobile Australia, and (due to a merger), Vodafone Australia at the same time. (Ultimately these two teams, working for two competing brands were merged into one, but that’s another story entirely). Suffice to say that during this period myself and my team worked closely with Nokia and all the other handset manufacturers. The Devices teams were groups of buyers and account managers who were responsible for buying phones from LG, Samsung, HTC, Blackberry, Sony/Ericsson and, most importantly at the time, Nokia. The team would look at the roadmap of phones from each of the manufacturers, choose the ones that were thought to suit our market the best, and negotiate the best purchase price from the supplier. The sheer number of phones we bought was huge, and of course, with that volume purchase came the inevitable price negotiation, and a sweetener of jointly employed marketing dollars from the manufacturer. Nokia were, at the time, the biggest supplier by far, offering good prices on reliable phones which were carefully designed to fit their exhaustive customer profiling methodology. They didn’t always get this design/targeting absolutely right, but it never mattered much. For example, the E71 with it’s QWERTY keyboard and early smartphone features was meant to compete with Blackberry in the enterprise space, but ended up being a massive hit with younger consumers who liked the keyboard, high quality finish and apps like IM and Email. Nokia had a very well thought through future view, which predicted a massive rise in (Nokia) smartphone take up, and a resulting huge increase in demand for data and data services. Quite what these services would be was a little unclear – Nokia and the operators knew it would be a combination of email, internet browsing, messaging and maybe video and audio streaming – and there were some nascent ideas that social was important too – in an era before Facebook and YouTube were really mainstream. Nokia had other great operational attributes. They were great at working their partnerships with the operators, could deliver on time, offered great price breaks as products went through their lifecycle, and were quite grown up by dynamic, only occasionally allowing their Scandinavian reservation to show through. Samsung : Shotgun approach, 100’s of phones designed with little or no view on consumer interests or segments. Plenty of marketing dollars to spend. LG : Similar to Samsung but logistics can’t be relied on and no marketing dollars. Blackberry : Inflexible and expensive. Only have one new device per year. Old fashioned UI. Uninterested in 3G. HTC : Windows phones, so the only one with true Microsoft Exchange email. Polarising phone designs. Sometimes they’re good designs, but mainly for business in low volumes. Sony/Ericsson : Small product range but very amenable to understanding the operators customers. Designs were often quirky, but reliable sellers. No price breaks on older devices and some marketing dollars. Apple, being the new arrival, were not interested in positioning themselves alongside the others. There was no roadmap of products, no particular interest to work with us as a channel to market, no shared marketing dollars, and worst of all, no negotiating on price or volumes. You got what you got, when Apple decided. There is not really any need to state though, that iPhone was a fantastic product, which we knew customers would buy in droves, and for all the difficulties that we found in bending to Apple’s absolute direction on pretty much every aspect of working with them, we did it anyway, bearing the full cost of the phone purchase, but selling an awful lot of iPhones. Nokia, meanwhile, quite arrogantly defended their first-to-market smartphone position (N73, N95, N96 anybody …) and chose to hark back to their now ageing credentials as the “best” User Interface which was by then relegated to Series 40 “candy-bar” phones. Nokia’s clunky and fragmented Operating Systems were not interesting to new developers (who mostly understood Java and not C++ for Symbian). 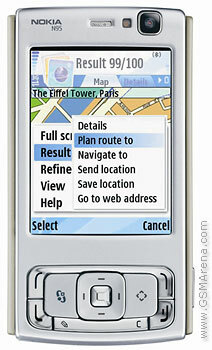 The developer eco-system was hard work, and the operators resisted letting Nokia get in the way of the operators perceived relationship with the developer and the end-user. In addition, the new inroads into touch screens were being ignored. HTC had a background in these, while Samsung were experimenting with mixed success. More interesting to everyone was BlackBerry’s success with QWERTY and understanding how to compete with that. Sony/Ericsson engineers at the time questioned me “Don’t you think touchscreen’s are just a fad ?” (No, I didn’t), and Nokia were just as dismissive. All of this combined to create the perfect opportunity for disruption. Nokia as the incumbent with the large operational business and existing, old, relationships was blind-sided by Apple, the new entrant who refused to play by (or was completely disinterested in) the existing rules of the game that Nokia and the operators played to. And they had a superior product. I hope Nokia do well in their new home at Microsoft, as they do still produce a mass of great feature phones, and their recent Lumia’s have mostly been really good. Windows Phone operating system is very, very good and is equal to, or better to use than iOS or Android in my opinion, and it’s finally starting to make some traction in the marketplace. Let’s hope Microsoft can get this right. Over the past few years I’ve found myself using Taxis more and more to get around the city, steadfastly ignoring the fact that using the most expensive form of transport, in a grid-locked city like Sydney, one of the most expensive cities in the world, was becoming frustrating and digging a big hole in my wallet. More than that, I found that in a Taxi I could never quite relax – always feeling somehow responsible for helping the Taxi driver navigate the best route, and always aware of the traffic jams around me. A minor comfort point is that I could never use my phone or ipad in a Taxi even on a short journey without feeling a bit queasy – not exactly the state I like to arrive to meetings in. Over the past couple of months this situation has changed … a lot … since I took the time to recognise the brilliance that is Google maps + Public transport. I’ve been using maps for a long time, but typically while driving. Now I’m using them all the time during the day and the only downside is that my phone battery doesn’t like it so much. Open Google maps on your phone. Tap on the directions button (circled red here). Use the default of My Location and add the destination. Tap the button that looks like a bus – for public transport, then either use the default of “any transport mode” or select bus, train, ferry etc from the drop-down list (all circled in red). Click Get directions. See a list of trips which include the walking time between stops, details of the stop number, bus number and time to complete the journey. Details of each trip can be viewed as a list or map. So far, apart from buses being late (only occasionally) this has worked beautifully. 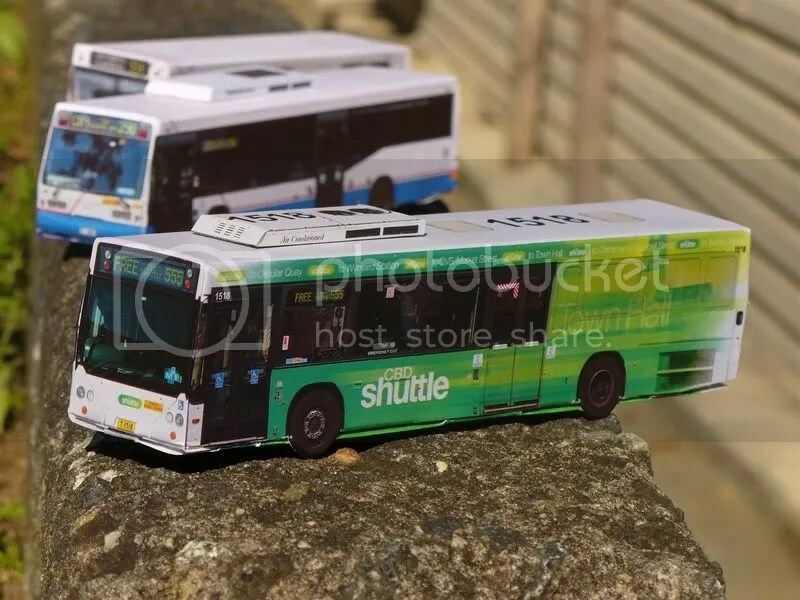 Now, with my additional discovery that there is a free shuttle bus around Sydney city, I’ve become a total advocate for public transport. The utility of this becomes more amazing when you compare this to the official offering from the local transport companies, which has the same information presented in a much less simple way, and it is impressive that Google can plug all of this data into their maps and make it make sense. Good job Goog. There is a third – “We were going to do it, but the business case didn’t stack up” – which I’ll deal with in a separate post. We’ve already tried that, it was a long time ago, didn’t work out how we expected (though we can’t remember why) and now it’s part of our history that we’d rather forget. We have something a bit like that somewhere on our plan – to be delivered in 3/5/10 years time. It’s a bit scary so we’ll continually de-prioritise it and subconsciously make sure it never gets done. It is definitely really important to treat past experiences as real, and to explore how perceived failures can be treated positively – to be learnt from and built upon. It’s also important to resolve or remove these blockages (if that’s what they are) to make sure that the people who made the comment can be brought on board, and not be allowed to undermine a new idea. Try exploring the real underlying issue behind the comment – maybe this can be achieved by very clinically dissecting the past experience and breaking down why it was deemed a failure, then contrasting this with the aims and measures which will be used to assess the success of the new idea. You might also consider giving an old failure a metaphorical wake, or Viking funeral – a heroic sendoff that signals to all involved that the old idea is gone, and now its time to move on to something new. Likewise, when “we’ve already thought of that” is the cry, the responding question has to be “well why haven’t you done anything about it ?”. Having ideas is easy, while executing the idea can often be really hard. A roadblock can be as simple as an anecdotal misunderstanding that just needs some new eyes and ears to unpick it to remove the roadblock. For example, in one company, a junior Lawyer made a disparaging comment about a concept that came to be eventually be distorted into “Legal won’t allow us to do it”. This put the concept into limbo for years before a new employee challenged the common misconception and brought the concept to life again. Sometimes an idea just needs to be at the right time. Reasons for not proceeding with an idea can change due to external factors … customer expectations and habits change, laws & regulations change, technology and the competition all change, so why wouldn’t some older ideas be worth revisiting in light of all this ? Yesterday morning I got out of bed at 4AM Sydney time to attend one of a series of free webinars on innovation run by Stanford center for professional development. 10AM in California doesn’t seem to be good for anywhere else as far as I can tell, yet there were 600+ people in attendance. Being free, these are (as you might expect) not terribly deep – being aimed at recruiting students into the paid courses by offering a brief intro to the course, however they do offer good insights into the topic, and also of Stanford itself. Particularly impressive is the calibre of the presenters and guests. The topic of “business models for innovators” was kicked off by professor Haim Mendelson, quickly moving to introduce the perspective of VC Howard Hartenbaum who described what, for him, makes a venture interesting enough to invest in, and also some of the indicators of a less interesting new business venture. Some of these seem a bit obvious (requires a lot of investment is a turn-off apparently), whereas the suggestion that click-based business models, or those in industries where acquirers don’t place a lot of value (services-oriented or relying on integration to legacy systems) were less obvious. The case study on RelayRides from CEO Andre Haddad caught me out as it is already a step ahead of what I thought was the quite new innovation of short term car rental (such as Goget in Australia). The business model – leveraging off the Sharing Economy, and increasing tendency of young people to not buy cars – cuts through the traditional car hire model by completely removing the need for RelayRides to own any cars at all. Very smart, and successful. Over the past week I’ve been writing my thoughts and opinions on why HTML5 is not perfect, but good enough for the needs of most Enterprise applications. Medium to large Enterprises are currently only at the point of being interested in mobilising their internal IT systems, and they are not yet at the point of committing time and money to think through what they need to mobilise their workforces. My expectation is that most organisations will make-do, only improving the mobile capabilities of their workforce as updates and new releases come from their traditional IT vendors. These updates and new releases will use a mixture of good and bad mobile design, and little in the way of User Interfaces re-imagined for mobile. Really speaking, this is no improvement over where these IT-led organisations have always been with their systems on desktop computers (and before that on computer terminals). Thinking about process re-engineering, User centric design and visual or creative design are not things that many companies are comfortable to address, and this problem will be exacerbated when the job of mobilising the organisation lands in the lap of the IT department. In addition, there will be a small group of companies that either start from scratch as mobile-native operations, or have the vision, time and resources to rethink how their business could be revolutionised by embracing mobility. These guys are the ones who are going to be successful through, and because of their mobility strategy. And, this is where HTML5 comes in. It’s not fantastic for creating engaging and visual interfaces on mobile, but it is very good for creating User Interfaces for form-filling and simple data entry (the bulk of business process rethinking currently appears to be about paper-form replacement), and, the skill sets needed to build and support HTML5 are 1) readily available, 2) mostly the same across many devices, and are therefore 3) cheaper to employ. HTML5 will win the day not because of any of its features, but ultimately because it is the easy, non threatening, cheap option. The story continues – HTML5 and what it is mostly likely good for in Enterprise. Native apps give ultimate access to the features of a given device. For example Android allows the developer to pretty much do what they like – even going as far as overriding the built-in phone dialler app if that is really whats wanted. Android does suffer from some fragmentation of the operating system though – either because the user is not using the most recent version of the OS, or because the device manufacturer has changed the base Android software – so some things don’t always work on every device. iOS is quite a bit more restricted both in terms of the device features that are made visible to the developer, and in terms of the functionality that Apple’s vetting process will and won’t allow. In contrast, HTML5 does not offer the developer access to all of the native device features. The browser on the device is somewhat abstracted from the underlying hardware and so while HTML5 does offer access to some functions which were traditionally only available to native apps – the camera for example – there are some things which it doesn’t do, or doesn’t do particularly well. Your hybrid app is installed onto the device in the same way as any other native app – downloaded from a website or Apple iTunes/Google Play. Some Hybrid technologies require the developer to ‘tool-up’ for each platform so that they can build and deploy the hybrid app to the app store. This would include using a Mac for any iOS development (which may seem like a small thing, but not every dev. shop use Mac’s). Note that there are Hybrid technologies around such as Trigger.io, Phonegap, and maybe others – which offer a service to build your app in the cloud, removing the need to tool-up for each device platform. Trigger.io is a personal favourite of mine due to it’s easy to use web based toolset vs. Eclipse IDE. In an attempt to provide generic support across platforms, not all Hybrid containers respect the uniqueness of all devices’ User Interface. The UI can look generic, meaning that at least in theory your users are not going to like it. In practice this may not be that big a deal. It is worth checking though that all the devices physical keys work in the expected way – e.g. as iOS don’t have a physical “back” key it may be missing or not work on a Hybrid app running on Android. More to come in conclusion on why only some of the above points and preceding posts are relevant to Enterprises.